Colorful petunias are the floral heartbeat of summer – reliable, adaptable and strong. They’ve been charming us for decades with their easy care, continuous bloom and a wide spectrum of colors. The original Grandiflora and Multiflora varieties have been joined by new hybrids and varieties that have even more color choices, improved disease and pest resistance, and outstanding performance in a wider range of weather conditions. Grandiflora petunias have large wavy flowers, as large as 3-4″ across. Plants are usually upright mounds 15-24″ tall and 24-26″ wide. The large flowers may suffer from rain or hail damage. Remove damaged flowers and deadhead old flowers regularly to keep them blooming. By mid-summer, the plants may suffer a bit from the heat. Light pruning will tidy them up and encourage new growth and flowers. Petunia series ‘Dream’, ‘Storm’, ‘Hula Hoop’, and ‘Daddy’ are all grandifloras. Multiflora petunias are a more compact plant with smaller flowers but prolific blooms, often covering the plant. They grow quickly and bloom through heat, wind, and storms. They are great for both large planting areas and containers. There are lots of varieties and colors. Look for ‘Carpet’,’Easy Wave’, and ‘Merlin’ multiflora petunias. Floribundas are hybrids of these two types, with many of the best features of both. They are free flowering and weather tolerant, with good disease resistance. Along with great color choices, you’ll find stripes, veining, star-shaped centers, colored edges, and bicolors. Series names to watch for include ‘Celebrity’, ‘Madness’, and ‘Prism’. Spreading petunias like ‘Wave’, ‘Easy Wave’, ‘Cascadia’, ‘Supertunia’, and ‘Surfina’ make beautiful container plants, hanging baskets and ground cover plantings. They can spread up to 3-5 feet across, covering flower beds and cascading from containers and hanging baskets. Plants are vigorous, heat tolerant and bloom all season. These are premium plants grown from selected cuttings. There are some astonishing colors and blends in this group. They’re a great value with a big impact. Plant petunias in full sun, with a little afternoon shade perhaps. Water when the soil surface feels dry so that they are moist but not wet. To keep them in full bloom, fertilize containers weekly and flower beds twice a month. 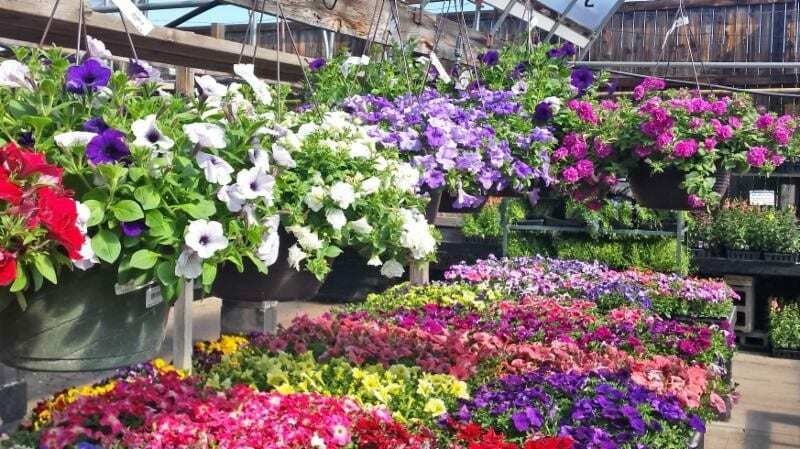 Visit Pinterest online to preview some of the many varieties of petunias at City Floral. When you come in, our expert staff is glad to help you with all your selections and questions. Find more gardening information here.